For other purposes, see Bugis (disambiguation). Bugis couple in traditional costume during their wedding. a An estimated 3,500,000 claim Buginese descent. The Buginese people are an ethnic group - the most numerous of the three major linguistic and ethnic groups of South Sulawesi, in the southwestern province of Sulawesi, third largest island of Indonesia. The Austronesian ancestors of the Buginese people settled on Sulawesi around 2500 B.C.E. There is "historical linguistic evidence of some late Holocene immigration of Austronesian speakers to South Sulawesi from Taiwan" - which means that the Buginese have "possible ultimate ancestry in South China", and that as a result of this immigration, "there was an infusion of an exogenous population from China or Taiwan." Migration from South China by some of the paternal ancestors of the Buginese is also supported by studies of Human Y-chromosome DNA haplogroups. The Bugis in 1605 converted to Islam from Animism. Some Buginese have retained their pre-Islamic belief called Tolotang, and some Bugis converted to Christianity by means of marriage; but they have remained a minority. Despite the population numbering only around 6 million, the Buginese are very powerful people and they have heavily influenced the politics in the present day states of Malaysia, Indonesia and Singapore. The current Prime Minister of Malaysia, Najib Razak and the current Vice President of Indonesia, Jusuf Kalla are both Buginese. Although many Buginese people live in the large port cities of Makassar and Parepare, the majority are farmers who grow wet rice on the lowland plains to the north and west of the town of Maros. The name Bugis is an exonym which represents an older form of the name; (To) Ugi is the endonym. The Buginese people speak a distinct regional language in addition to Indonesian, called Basa Ugi, Bugis or Buginese. In reality, there are several dialects, some of which are sufficiently different from others to be considered separate languages. Buginese language belongs to the South Sulawesi language group; other members include Makassarese language, Torajan, Mandar and Enrekang, each being a series of dialects. Aru Pancana We Tenriolle, Queen of Tanette, South Sulawesi. Pictured accompanied by court ladies. The homeland of the Buginese is the area around Lake Tempe and Lake Sidenreng in the Walannae Depression in the southwest peninsula of Sulawesi. It was here that the ancestors of the present-day Bugis settled, probably in the mid- to late second millennium BC. The area is rich in fish and wildlife and the annual fluctuation of Lake Tempe (a reservoir lake for the Bila and Walannae rivers) allows speculative planting of wet rice, while the hills can be farmed by swidden or shifting cultivation, wet rice, gathering and hunting. Around AD 1200 the availability of prestigious imported goods including Chinese and Southeast Asian ceramics and Gujerati print-block textiles, coupled with newly discovered sources of iron ore in Luwu stimulated an agrarian revolution which expanded from the great lakes region into the lowland plains to the east, south and west of the Walennae depression. This led over the next 400 years to the development of the major kingdoms of South Sulawesi, and the social transformation of chiefly societies into hierarchical proto-states. Bugis children in traditional attire in Singapore, circa 1890. 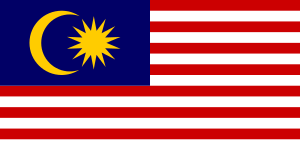 The conclusion in 1669 of a protracted civil war led to a diaspora of Bugis and their entry into the politics of peninsular Malaysia and Sumatra. The Bugis played an important role in defeating Jambi and had a huge influence in Sultanate of Johor. Apart from the Malays, another influential faction in Johor at that time was the Minangkabau. Both the Buginese and the Minangkabau realised how the death of Sultan Mahmud II had provided them with the chance to exert power in Johor. Under the leadership of Daeng Parani, the descendants of two families settled on the Linggi and Selangor rivers and became the power behind the Johor throne, with the creation of the office of the Yang Dipertuan Muda (Yam Tuan Muda), or Bugis underking. Long before European colonialists extended their influence into these waters, the Makassarese, the Bajau, and the Buginese built elegant, ocean-going schooners in which they plied the trade routes. Intrepid and doughty, they travelled as far east as the Aru Islands, off New Guinea, where they traded in the skins of birds of paradise and medicinal masoya bark, and to northern Australia, where they exchanged shells, birds'-nests and mother-of-pearl for knives and salt with Aboriginal tribes. The Buginese sailors left their mark and culture on an area of the northern Australian coast which stretches over two thousand kilometres from the Kimberley to the Gulf of Carpentaria. Throughout these parts of northern Australia, there is much evidence of a significant Bugis presence. Each year, the Bugis sailors would sail down on the northwestern monsoon in their wooden pinisi. They would stay in Australian waters for several months to trade and take trepang (or dried sea cucumber) before returning to Makassar on the dry season off shore winds. As Thomas Forrest wrote in A Voyage from Calcutta to the Mergui Archipelago, "The Buginese are a high-spirited people: they will not bear ill-usage...They are fond of adventures, emigration, and capable of undertaking the most dangerous enterprises." Most present-day Buginese now earn their living as rice farmers, traders or fishermen. Women help with the agricultural cycle and work in the homes. Most Buginese people live in stilted houses, sometimes three meters (9 ft) or more off the ground, with plank walls and floors. Many of the marriages are still arranged by parents and ideally take place between cousins. A newlywed couple often lives with the wife's family for the first few years of their marriage. The Buginese' diet consists mainly of rice, maize, fish, chicken, vegetables, fruit and coffee. On festive occasions, goat is served as a special dish. The Buginese people recognise five separate genders. These are makkunrai and oroané, which are similar to cisgender male and female respectively, as well as calabai, calalai, and bissu, which are less easily comparable to Western ideas of gender. In the early 17th century, the Minangkabau ulema, Dato Ri Bandang, Dato Ri Tiro, and Dato Ri Patimang spread Islam in South Sulawesi. The Bugis converted from indigenous animistic practices and beliefs to Islam. A few west coast rulers converted to Christianity in the mid-16th century, but failure by the Portuguese at Malacca to provide priests meant that this did not last. By 1611, all the Makasar and Bugis kingdoms had converted to Islam, though pockets of animists among the Bugis To Lotang at Amparita and the Makasar Konja in Bulukumba persist to this day. Abu Bakar of Johor, the 21st sultan of the Johor Sultanate in Malaysia. Amir Syamsuddin, current Minister of Justice and Human Rights of Indonesia. B. J. Habibie, the 3rd President of Indonesia. Erna Witoelar, former Minister of Human Settlements and Regional Development of Indonesia. Jusuf Kalla, Vice President of Indonesia. Lisa Surihani, Malaysian actress, model, television host and commercial model. Najib Razak, current and 6th Prime Minister of Malaysia. Raja Ali Haji, a 19th-century historian, poet and scholar. Sultan Salahuddin Shah, the 1st sultan of the Selangor Sultanate in Malaysia. Tun Abdul Razak, the 2nd Prime Minister of Malaysia and father of Najib Razak. ↑ Akhsan Na'im, Hendry Syaputra (2011). Kewarganegaraan, Suku Bangsa, Agama dan Bahasa Sehari-hari Penduduk Indonesia Hasil Sensus Penduduk 2010. Badan Pusat Statistik. ISBN 9789790644175. 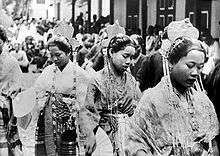 ↑ "Bugis, Buginese in Malaysia". Retrieved 2016-09-14. ↑ Li, H; Wen, B; Chen, SJ; et al. (2008). "Paternal genetic affinity between Western Austronesians and Daic populations". BMC Evol. Biol. 8: 146. doi:10.1186/1471-2148-8-146. PMC 2408594 . PMID 18482451. ↑ Said, Nurman (Summer 2004). "Religion and Cultural Identity Among the Bugis (A Preliminary Remark)" (PDF). Inter-Religio (journal) (45): 12–20. ↑ Mills, R.F. 1975. Proto South Sulawesi and Proto Austronesian phonology. Ph. D thesis, University of Michigan. ↑ Caldwell, I. 1995. 'Power, state and society among the pre-Islamic Bugis.' Bijdragen tot de Taal-, Land- en Volkenkunde 151(3): 394-421; Bulbeck, D. and I. Caldwell 2000. Land of iron; The historical archaeology of Luwu and the Cenrana valley. Hull: Centre for South-East Asian Studies, University of Hull. ↑ "Archived copy". Archived from the original on 28 July 2012. Retrieved 2011-07-25. ↑ Graham, Sharyon (1 July 2004). "It's like one of those puzzles: Conceptualizing gender among Bugis". Journal of Gender Studies. ↑ Loveard, Dewi (1999-06-25). "Target: The Attorney General Andi Ghalib is himself the subject of a probe". Asiaweek. Retrieved 2016-06-07. Wikisource has the text of the 1911 Encyclopædia Britannica article Bugis. 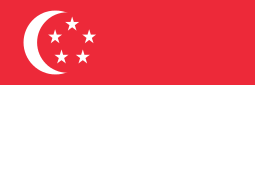 Wikimedia Commons has media related to Bugis.